Another week of domestic football concluded and the biggest winners for the weekend are league leaders, Plateau United. The Kennedy Boboye led side hauled Gombe United 5-1 which sees the Jos side keeping their place at the summit of the log with 5 points. Calabar saw red, as Kelly Kester and Chinedu Ozor were sent-off in the duel that ended 2-1 in Enyimba’s favour. The two goals for the Peaples’ Elephant came from the stables of captain Mfom Udoh, leading his goal tally to 10 so far. Chimezie Amanfor got the only goal for the visitors; they are 12th on the log with 32 points in 24 games. The Aba giants are now 3rd on the log. This is their highest since mid-season of last season. 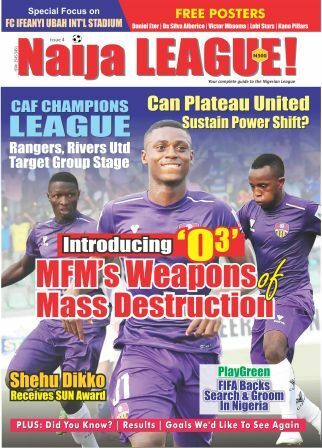 MFM FC came out the better side in the southwest derby held inside the Soccer Temple, Agege. The game was decided by just a solitary strike courtesy of Monday Shishinma who got an assist from Shola Brossa. The Lagos based side will also celebrate this victory as their first NPFL win over Shooting Stars Sports Club after three previous meetings. The defeat has left 3SC occupying the base of the log as their relegation battle thickens. FC Ifeanyi Ubah finished on a futile note in Port Harcourt. The Nnewi based side let loose and conceded in the late minutes, thereby giving Rivers United the whole three points. Bolaji Skain and Prince Agrrey converted the spot kicks for their respective teams until Efosa Eguakun broke the tie in added time. The Anambra Warriors have dropped to fourth place, while Stanley Eguma’s Rivers United continue their struggle to ascend the table, from 16th position. Katsina United whooped El-Kanemi Warriors by 3 three replied goals. A brace from Musa Suleman and a goal from substitute Obinna Eleje was enough for the Change Boys to humble their visitors. El-Kanemi are placed 5th on log with 37 points from 24 games while homers, Katsina United at the bottom half of the table, 13th to be precise from same number of games. Back from their goalless draw in Umahia, Remo Stars picked maximum points over Nasarawa United in the weekend’s encounter. By virtue of this win, Remo Stars vacate the base of the table, but are still threatened by relegation. 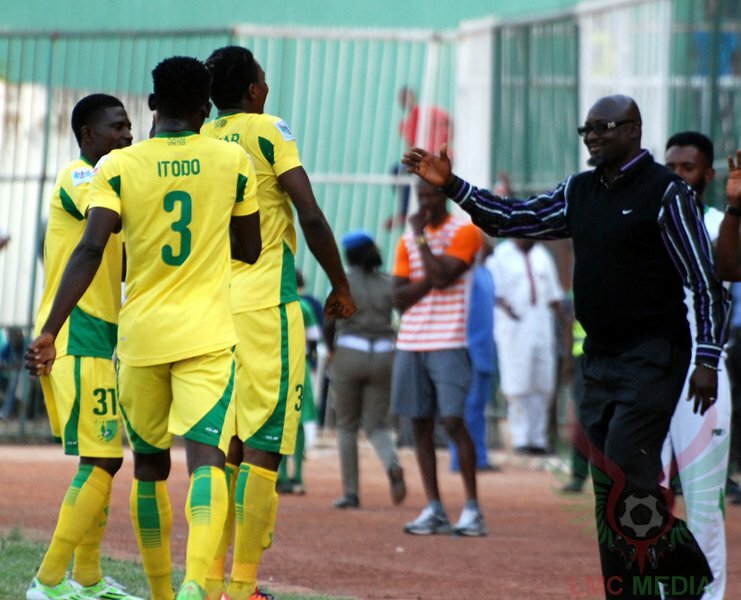 Wikki Tourists are gradually getting their groove on as the defeated Minna based Niger Tornadoes 3-1 in Bauchi. Wikki Tourists’ Victor Alegbe and Ahmed Usman contributed to the shoreline while Andrew Ikefe got one back for the visitors. Another 3-1 score line in Kano. Masu Gida got the better off Sunshine Stars, causing more trouble for the visitors after their gaffer; Austin Eguavoen resigned days before the game. Sunshine Stars are still in the drop zone with 27 points so far, while Kano Pillars are 9th on the log having garnered 34 points from as many games. Coach Chukwuma Agbo led Rangers to a 1-0 defeat over Akwa United in the Matchday 24 encounter at the Cathedral. Bright Silas gave Rangers the lead in the 11th minute and eventually became the match winner for the day. Akwa United only resumed action this weekend after they were out for two Matchdays. The both sides are on the bottom half of the table. ABS got back to winning ways by getting a slim win over ten-man Lobi Stars. The Saraki Boys were successful in keeping out the likes of Tony Okpotu and Kingsly Eduwo who are regular goal poachers for the Pride of Benue. The solitary strike of the game came at the stroke of half time by Akinbo Oluwasegun.